Residents of 700 Sussex Dr Condo Ottawa can feel the prestige of their address knowing they reside on the same street as the Prime Minister of Canada. 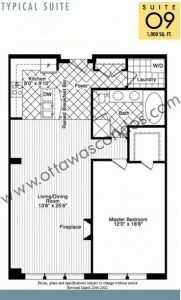 700 Sussex Dr Condo Ottawa was built by Claridge Homes in 2005 & is one of Ottawa’s most immaculate condo buildings. It sits on the west side of the Byward Market just blocks away from Parliament and the majestic Fairmont Chateau Laurier. The building features a sleek exterior of light grey stone complimented by thin windows. 700 Sussex Dr Condo Ottawa is home to 70 units sitting on 10 storeys. Units range from studios to penthouse suites. Units on the 8th floor have direct access to the elevated outdoor garden. The lavish lobby is traditionally designed is a miniature art gallery in itself, with many paintings gracing the walls. 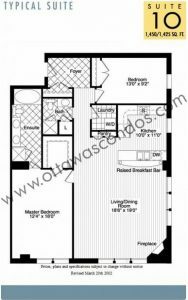 Building amenities include a 24 concierge, underground parking, fitness center, whirlpool, games room, business center with gourmet kitchen, reception room, and an elevated outdoor garden. 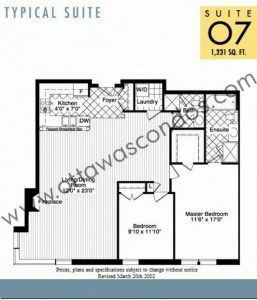 700 Sussex is located in The Byward Market. The environment and ambiance is what makes the Byward Market what it is. It really thrives in the warmer months with the open-air market being one of the city’s top destinations. Flowers line the streets and the smell of food fills the air. Parliament Hill is also just on the outskirts of the Byward Market, making visiting a breeze for residents of this neighbourhood. Most of the Byward Market’s residents name the restaurants and bars as one of the area’s best attractions. A handful of art galleries and well curated independent clothing stores can all be found within walking distance. As if all these are not enough, there are a number of small, quirky stores where you can find everything from handmade cards to roller skates. And of course, all of these sights and experiences are connected by well designed pedestrian and bike paths that will make you never want to drive again. 700 Sussex is a low-rise building.Low Rise apartments can be found all over the world. Depending on the city, they can be a highly sought after living arrangement. 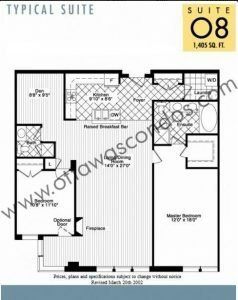 Low Rise condos with most commonly be referred to buildings of less than four stories. They tend to be walkups without the benefit of an elevator. The charm and character of these buildings makes up a large part of the draw. Smaller buildings that are less expensive to build overall, may include more architectural features and other design features that set it apart. Newer builds in particular will strive to keep the continuity of the neighbourhood. They may take historical reference from the buildings around them, and strive to offer what can’t be found in a high rise buildings. These thoughtful Low Rise projects are of particular importance in neighbourhoods where bylaws stand to uphold sight lines and other existing community elements. In some parts of the world the buildings may have historic value and are sought after for their cultural cache. The uniqueness of these buildings sets them apart as one of a kind living spaces. Older Low Rise buildings may lack some of the amenities of newer Low Rise builds. However, new units are not as easy to find with rising cost to build and developers wanting to maximize the number of units in their buildings. This is most evident in urban centres where density and cost of the footprint for the land are high. In the developing suburbs around city centres, new builds of all heights can be found. The density of outer urban centres is increasing at super speed. 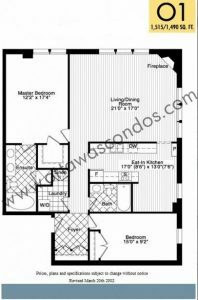 These newly designed communities offer much by way of options, including interesting low rise choices. The size of Low Rise buildings can vary greatly, with just a few units or they may be quite dense. The choices for configuration of Low Rise buildings can also have a wide range. Some townhouses share a sidewall, are two or three stories and might include a front and back entrance and yard. Similar units may be found that are stacked, run front to back and may still include multiple stories within the units. These units may or may not all have entrance at grade. 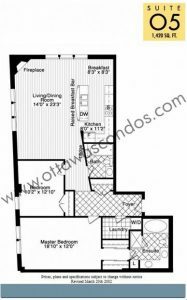 It’s also possible to find townhouses that have back to back configuration, where units share a backwall. Multi-story low rise apartment buildings will have units that are stacked vertically, usually with fewer than four floors and will share an interior corridor. There are fewer examples of older buildings that share an exterior corridor. Hybrid buildings will have grade access units at the base with stacked units on top that share in interior corridor.